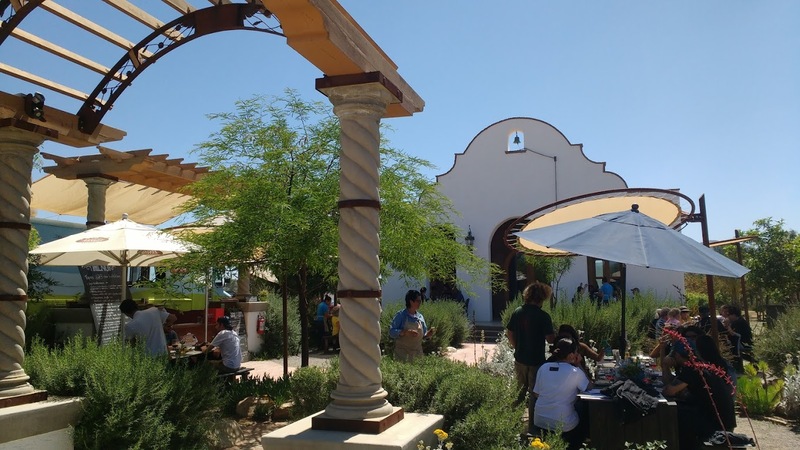 Adobe Food Truck at Adobe Guadalupe winery is a perfect change of pace for your Valle de Guadalupe wine tour. 5. The scene is peaceful in a beautiful garden with ample shade. You are at a picnic in the wine valley. 4. The menu and food is always evolving with fresh choices and a variety of options. 3. Service by owner/chef Leda(photo center) is outstanding. Seeing Leda and team scurrying from table to table to assist customers with information, food an beverages is a fun people watching event. 2. Beverage choices are good with beer and wine available to quench your thirst. The Adobe Guadalupe wine tasting room is in the adjacent building so you can sample and purchase their outstanding wine. New for me was AFT’s IPA beer with lychee. 1. The food and beverage value is excellent. You can feed four people on a frugal lunch budget while sharing several different flavors from Adobe Food Truck’s kitchen. Sandwiches, salads, Iberian ham and small plates are all part of AFT’s offerings. The chalk board menu inspires your taste buds as you smell the food being prepared in the truck. You can also check out the choices made by other guests while you wander through the garden. Our food choices included a salad, shrimp and a savory mushroom dish this Saturday. This was our “surprise me” dish from Leda with Polish sausage, shrimp and spuds, yum. Adobe Food Truck gets our 5 road flare award(out of 5 flares possible) to guide your way to the fabulous food and fun at AFT in the Valle de Guadalupe.